If you have a south-facing roof without solar panels on it, you’re probably paying too much for hot water. 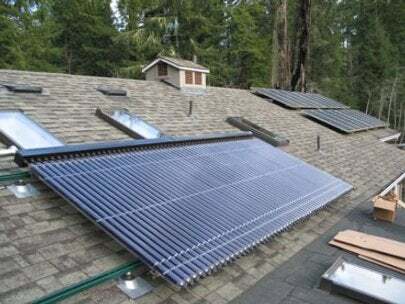 Over a million and a half homes and businesses in the U.S. have already invested in solar hot water systems, and they’re reducing their fuel use by as much as three quarters, even in cooler climates. That’s a huge dollar savings…but over twenty years, one solar water heater keeps 50 tons of carbon dioxide out of the atmosphere…and takes us one more step toward breaking that nasty fossil fuel habit. Be sure you’re getting equipment and installation that’s certified by the solar rating and certification corporation or the Florida solar energy center. Many cities and states are offering energy incentives to homeowners, and solar lease deals whereby you can benefit from the cost savings of the system on your roof without paying for it! Don’t forget to check the department of energy’s database of state incentives for renewable energy, or D.S.I.R.E. , for federal tax rebates for going solar!